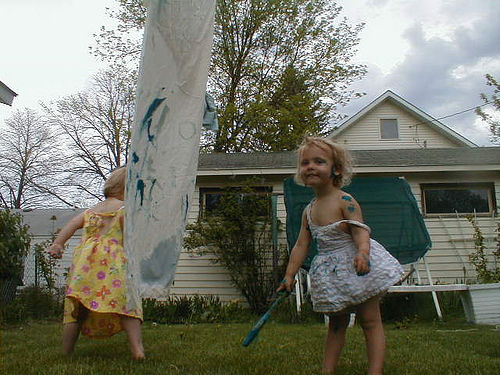 Those who have been reading Magical Childhood for a while know that I often recommend sheet painting. It’s even one of the first crafts I put up on the original Magical Childhood site. 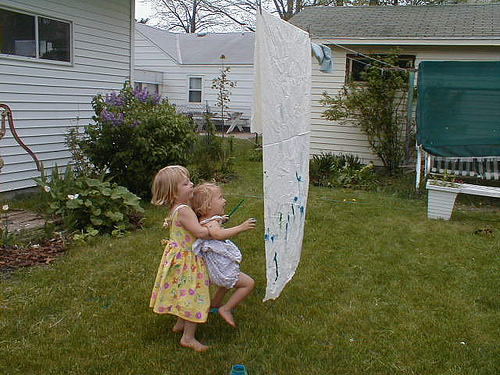 We have been using an old white bed sheet for crafts and sheet painting for over a dozen years now. 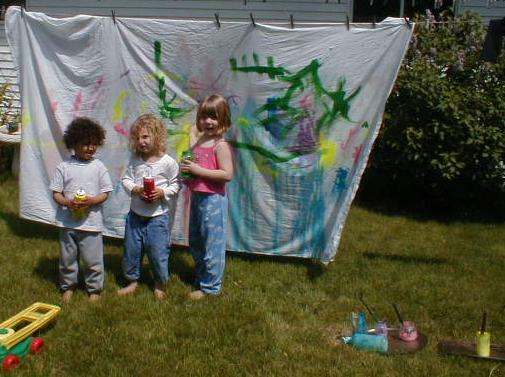 In the summer time, we hang it on the clothes line and the kids use paint to decorate it. Sometimes we put it on the ground and they decorate it with their feet. 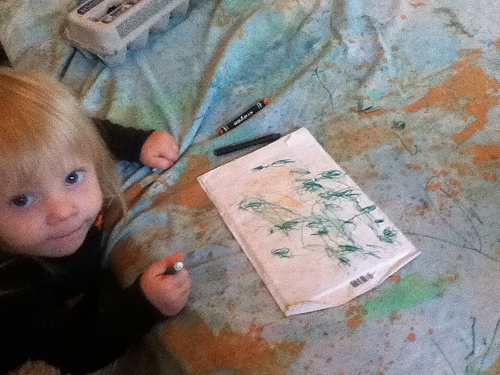 Sometimes it’s washable paint, sometimes not. The sheet looks different every year and every project. 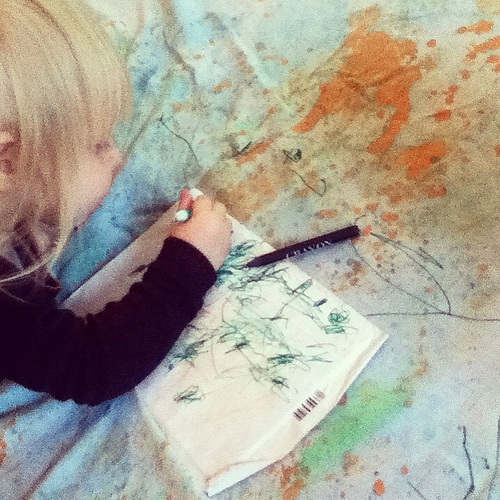 In the winter time and on rainy days, the sheet is our art tablecloth. 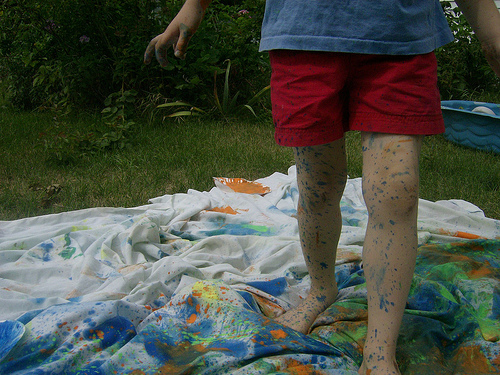 It doesn’t matter how messy or staining an activity is, because if it stains the craft sheet it just adds more character and another memory. I love my craft sheet and it makes me smile every time I spread it on the table or hang it on the line for another round of staining. It’s so amazing to look at little one year old Fiona using it now and remembering when her teenage sisters were making those stains. 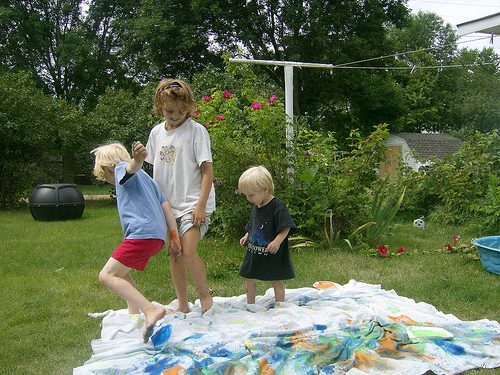 You can use any old flat bed sheet for an art cloth or pick one up for a dollar or two from a thrift store. I highly recommend starting your own. Easy, Sturdy (Free) Building Blocks! Here’s a little project that we’ve been doing for years. These fun blocks are so easy! I was planning on making a set of building blocks for Fiona for Christmas, but she kept trying to manhandle the presents under the tree so I decided to make her a set of “presents” of her own. Save your cartons of drinks like almond milk and orange juice. You’ll need two cartons for each block. Cut off the top. Rinse and dry. Fit one carton into another (open ends facing each other), so that the block is closed on all sides. This also makes it very sturdy, since it’s basically doubled up. Wrap with wrapping paper or cover with contact paper. If you use paper, you can seal it with clear contact paper. You can also tape on family pictures, magazine pages or other fun images before sealing with contact paper. That’s it! You can change them whenever you like by simply wrapping them with a new wrapping paper or covering with another layer of paper and contact paper. When my bigger kids were little, I made a “marble” set with marble contact paper so it looked like they were building stone buildings. 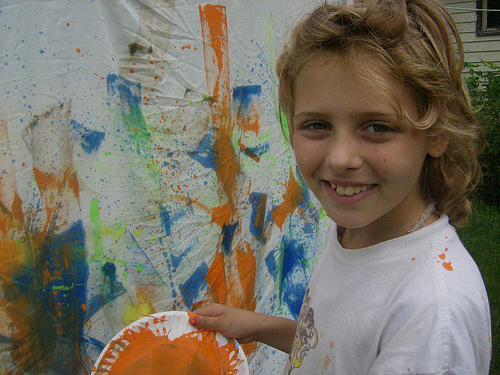 Have you visited the blog Let the Children Play ? 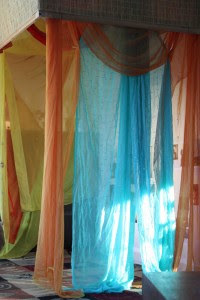 I find myself frequently pinning Jenny’s lovely posts because they are so wonderful for simple, magical, child-led fun. 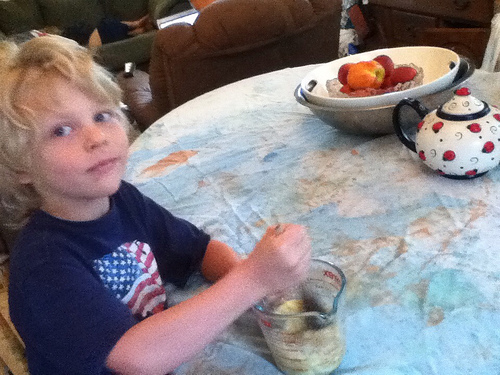 Have you tried Brushster with your kids yet? This free painting program from the National Gallery of Art lets kids paint with a variety of “brushes” online, or they can click a button to watch the program create art on its own. NGA has tons of other cool art programs too. Check out the list here! Here’s a fun and inexpensive way to make some neat building blocks for little ones. Our fabulous friend Jan, a local Head Start teacher, came up with this idea. She purchased a couple of $1 bags of foam blocks from Target and then purchased some adhesive velcro. She cut the velcro into tiny squares and affixed it to most sides of the blocks. 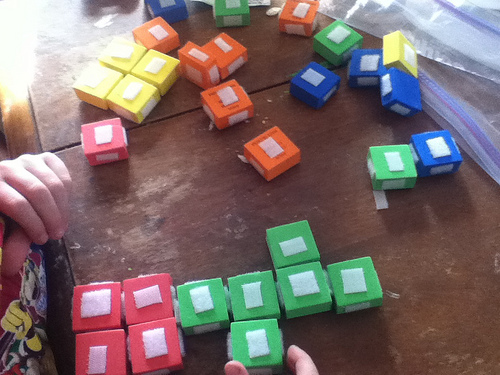 Our boys played with the new sticky blocks yesterday and had great fun. 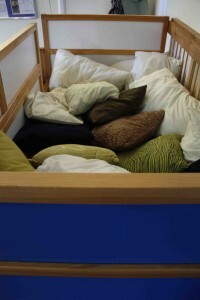 You could also use the idea with wooden blocks or any number of household objects. 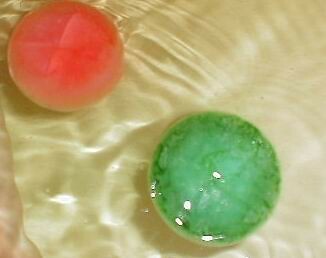 Here’s a simple way to make baths a little more fun (and colorful!). 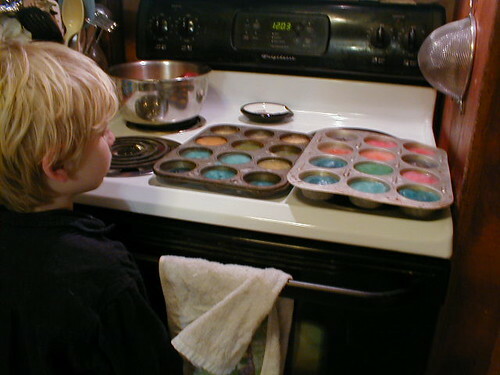 Freeze some colored water in muffin tins or other medium sized containers, and then add a few to the kids’ baths when you want to make things a little more interesting. 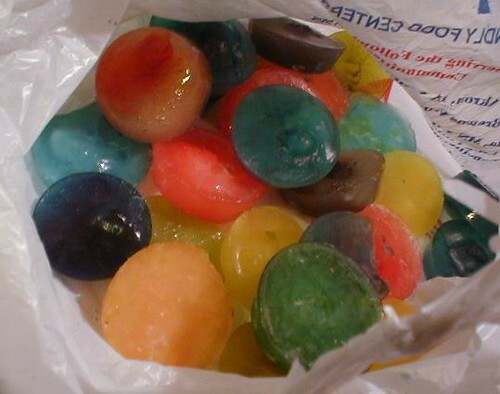 They melt pretty fast but it sure is fun while they do!